In 2013, Science magazine named cancer immunotherapy the scientific breakthrough of the year. It featured two active fields of study at Memorial Sloan Kettering as leading areas of research. One of those fields is chimeric antigen receptor (CAR) therapy, which is based on the premise that a patient’s own immune cells can be trained to recognize and attack cancer cells. This approach has shown early potential in treating certain kinds of blood cancer, but researchers have yet to determine the best way to apply it to treating solid tumors. 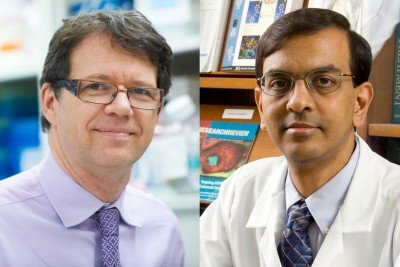 A study published earlier this month in Science Translational Medicine suggests how this technique might be applied to tumors of the pleural cavity, the area in the chest found just outside the lungs. The pleural cavity is the most common location in the body for rare, aggressive tumors called mesotheliomas and is also a frequent site of metastasis for other tumor types, including lung and breast cancers. In CAR therapy for leukemia, immune cells called T cells are genetically engineered to recognize the CD-19 protein, which is found on the surface of blood cells called B cells. Since CD-19 is not present in pleural tumors, investigators needed to identify another target — a protein that’s present in these tumors yet not in most other cell types — in order to protect healthy cells from attack. They found these attributes in a protein called mesothelin. Mesothelin is present in almost 90 percent of mesotheliomas, as well as 60 percent of lung adenocarcinomas and 35 percent of triple-negative breast cancers (the most difficult-to-treat type of breast cancer). Previous studies conducted by the MSK team showed that the presence of mesothelin indicates that a cancer is more aggressive and less likely to respond to other treatments, such as radiation or chemotherapy. For the CAR therapy research to move forward for pleural tumors, the investigators spent several years developing mouse models that closely mimic this type of cancer — the first ever developed. 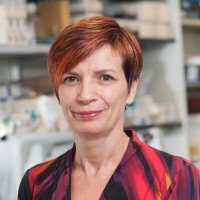 They also focused on finding ways to manufacture T cells engineered to recognize the mesothelin protein, work led by MSK’s Cell Therapy and Cell Engineering Facility under the direction of Isabelle Rivière. CAR T cell therapy works by filtering out a patient’s T cells and — outside the body — introducing a new gene into the cells. That gene encodes a receptor that enables the T cells to recognize a protein present on the surface of cancer cells — in this case, the mesothelin protein. In CAR therapy for leukemia, the engineered cells are reintroduced to the patient through the bloodstream, but for pleural tumors the investigators found another way. In the majority of mice, the tumors were eradicated and didn’t come back. And two further experiments — conducted 100 or 200 days after the mice had been infused with T cells — showed that the immune cells had persisted and still were able to kill the cancer when new tumors were introduced. Based on the mouse studies, the investigators plan to launch a clinical trial in early 2015 to find out if the treatment is safe for people with solid tumors in the chest cavity. This research was funded by the American Association for Thoracic Surgery Third Edward D. Churchill Research Scholarship; the Experimental Therapeutics Center at MSK; William H. Goodwin and Alice Goodwin; the Commonwealth Foundation for Cancer Research; the Lake Road Foundation; the National Institutes of Health and the National Cancer Institute under grants R21 CA164568-01A1, R21 CA164585-01A1, 2T32CA9501-26A1, and P30 CA008748; the US Department of Defense under grants PR101053 and LC110202; and the Stand Up To Cancer-Cancer Research Institute Immunotherapy Dream Team. Stand Up To Cancer is a program of the Entertainment Industry Foundation administered by the American Association for Cancer Research. Hello, first of all, thanks for all your hard work and dedication; you truly are heros. Does your research and/or planned clinical trials involve the sequencing of the tumor's genome in order to identified cells from the immune system that may attack a specific mutation in the malignant cells? Is gastro-esophageal cancer considered a solid tumor in the pleural cavity, and as such be a potential candidate for your upcoming trials? Thank you. Good Evening: I am interested in finding out about possible enrolling in this upcoming trial. I have been a patient at msckk for two years. i have triple negative breast cancer which has metastized to my spine and lungs. I recently participated in a trial which was stopped by the sponsor due to the the fact that all patients enrolled were not responding. I am considering participating in a trial run by Dr. Monchok which involves immunotherapy which is an intravenous infusion. Is there anyone I can speak to to find out if and when I can participate in this trial? My oncologist is Dr. Tiffany Traina, who helps me find trials that she thinks are appropriate for me. I thank you for all that your staff does to help and support their patients. Thank you so much and I look forward to hearing from you. Joyce, since you are already a patient of Dr. Traina’s, we recommend you speak with her about which trials may be right for you. Thank you for your comment. I was operated for thymoma by Dr Bains on 6th August . Pleurectomy with decorticaton was done. would you enroll such patients to avoid recurrence with this kind of therapy. Muneeb, we forwarded your question to Dr. Adusumilli, who responded, “Patients with thymoma are not included in our protocol. Patients with thymic cancer are potential candidates for mesothelin-targeted immunotherapy in future protocols.” Thank you for your comment. I am stage 4 rectal patient with nothing else left for me to try. My rectal cancer mestasized to the lung area. Would I be eligible for this trial. This trial is for patients with mesothelioma, breast cancer, or non-small lung cancer whose tumors express a particular protein, called mesothelin. To find out about trials MSK has open for advanced rectal cancer, you can call our Physician Referral Service at 800-525-2225 or go to https://www.mskcc.org/experience/become-patient/appointment for more information on making an appointment. Thank you for your comment. My husband has just begun remission from small cell lung cancer, extensive. He will soon begin brain radiation as a prophylactic. Is there any new work being done to prevent the recurrence of his cancer? Thank you for reaching out. To find out about treatment options for your husband, we recommend you call our Physician Referral Service at 800-525-2225 or go to https://www.mskcc.org/experience/become-patient/appointment for more information on making an appointment. Thank you for your comment. Withdraw from this trial. With best regards. Carolyn, if you would like to make an appointment at MSK to arrange for treatment or a second opinion, you can call 800-525-2225 or go to https://www.mskcc.org/experience/become-patient/appointment for more information on making an appointment. Thank you for your comment. I now have Stage 4 non small cell adenocarcinoma. A very early metastasis was to a lymph node located just under the pulmonary artery and my heart. It has not responded to radiation or chemotherapy and has sent out cancer cells almost everywhere using pathways of the lymphatic system. I believe my best chance for some quality time--no cure, I understand--would be an immunotherapy or targeted genetic therapy. Do you know where any Medicare approved studies might be found for me??? Dear Thelma, we are sorry to hear that your cancer has spread. Clinical trials are testing immunotherapy drugs in all settings, including as a first-line therapy in patients with advanced lung cancers, and in patients who have previously received chemotherapy. If you have any questions about these trials or would like to make an appointment for a consultation with one of our specialists, please call our Physician Referral Service at 800-225-2225. Thank you for reaching out to us. My father is at Stage 4 non small cell lung cancer, and it has spread to brain, there are 2 tumors in his brain. Now he is on chemotherapy and WBRT, and the DNA test shows that targeted medicine is not available for him. He doesn't feel any pain from the breast or hard breathing, but feel pain from brain, how do we deal with it later on? Dear Nick, we’re very sorry to hear that your father is going through this. We recommend that you talk to his oncologist about getting a referral to a pain specialist. Thank you for your comment, and best wishes to you and your family. I have triple negative metastatic breast cancer. I had a lumpectomy in Feb. 2013 when the cancer was only at Stage 1 and had 6 weeks of radiation. It has come back in the chest wall completely outside the breast and is now at Stage 4. I had three weeks of radiation recently, and am unsure what should come next as far as drug therapy is concerned. I am 71 years old and wonder if any of your clinical trials apply to my condition. I have already lost weight (and I was thin to start with) and wish to avoid chemo if possible, but will accept if there is nothing else. My oncologist says there is one receptor that is partially receptive, but I worry that may not be enough to uptake the necessary non-chemo drug. Thank you for any insight you may give and thank you for research on triple negative! Dear Celia, we’re very sorry to hear about your cancer recurrence. If you are interested in speaking with someone at MSK about whether a clinical trial is right for you, you can call our Patient Access Service at 800-525-2225 or go to https://www.mskcc.org/experience/become-patient/appointment for more information. Thank you for your comment, and best wishes to you.